Welcome to Full Plate Thursday, I am so excited to see you today. We have been so busy getting ready for our Easter Celebration, coloring eggs, making special basket's, baking and last minute shopping. It is such a special time of the year that gives us renewal and hope. I can't wait to see what you have in your basket today, so lets head for the table and get started. Thank you so much for coming today and I wish you and your family a very special Easter Celebration! I shared a recipe for grain-free apple kugel and amazing macaroons Also, a grain-free Passover dinner menu. Join the fun! I’m giving away 2 pounds of Celtic Sea Salt! Your lemon cake looks divine! Thanks for hosting! I shared my fast and easy Broiled Catfish with Artichokes and Tomatoes. I hope you have a lovely Easter! Thanks for putting my pea salad on your plate! And thanks, as always, of hosting! Miz Helen, I have shared Cream Cheese Chicken Enchiladas and Tomato & Cucumber Salad. Thank you for hosting! Thanks for hosting! Wishing you and your family a happy and blessed Easter! Thanks so much for featuring my salad! Have a very Happy Easter! Hi Miz Helen, I've linked up my Split Pea and Spinach Stew and my Italian Chicken and Sausage Casserole. Have a great Easter! Good afternoon, Miz Helen, I've brought a plate of eggs to share! Thank you for hosting, have a nice day! Good morning Miz Helen. Today I bring my Syrupy Lemon Cake with Candied Lemons to celebrate Spring! Thanks for hosting have a great weekend ahead! Hello. Thank you as always for hosting. Good Morning Miz Helen! I have linked up my potato salad recipe made with fingerling potatoes. Thank you so much for hosting. Have a wonderful day! Miz Helen, I'm so glad to learn you are safe from those horrible storms. This year has certainly started off in a bad weather direction. Hope you have a beautiful Easter and thank you for hosting Full Plate Thursday. I've brought a Dutch Baby with Lemon Sugar for Sunday morning breakfast. Miz Helen, thank you for hosting... have a blessed Easter! Thanks for hosting, Miz Helen! Your list looks fabulous! Especially the Spring Pea Salad. Yum!! Thank you so much for featuring my stuffed portabellas! I really appreciate it. Thanks for hosting and have a fabulous Easter!! Thank you so much for hosting. Hope you have a happy Easter! Sharing a recipe for chocolate chip pumpkin muffins made by my daughter "all by herself" this time. :) Pumpkin may not be currently seasonal, but it is delicious nonetheless! Thanks for hosting, Miz Helen, and a blessed Easter to you and yours! 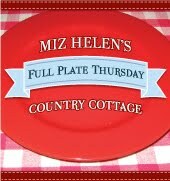 Miz Helen, looks like another delicious full plate! I'm sharing 20 Reasons You Might Be Crunchy, Thai Coconut Curry Mussels, and a video on How To Turn the Forgotten Food In Your Fridge Into An Amazing Meal. Thank you so much for featuring my Potato Leek Soup-what an honor! This week I shared my 30 Second Smoothie and Apple Cinnamon Spice Cake recipes. Have a wonderful Easter weekend! Thanks for hosting Miz Helen!! Couldn't get my pic to upload, so had to use the generic one. My submission is Corn Flake Candy, it is a family favoirte. Hope that you have a great Easter!! Great recipes to choose from this week! We linked up a wonderful burrito pie today. Have a Happy Easter. Your Easter celebrations sound like fun, and your Lemon Coconut Cake looks and sounds just wonderful! I love the combination of lemon and coconut, so fresh and delicious. This week I have shared my Warm Wild Rice Salad with Sausages and Apple. Thank you for hosting, and Happy Easter! Perfect for Easter baskets, it's my version of honey-sweetened Almond Roca. You can make it as is, with a honey-sweetened chocolate layer, or you can make it with a white chocolate layer (if you are on GAPS and can only digest the cocoa butter). Hi! Just linked up a couple of my favorites from this week: Butternut Squash Mac & Cheese, and a Cheesy Spring Veggie Breakfast Bake. Thanks for hosting. thanks for hosting another great party. I linked up two easy Easter ideas. today i've linked up my recipe for lazy lady's quesadillas. because quesadillas are fun. and we all need a little more fun. Thanks for hosting! I have linked up fondant covered Easter Egg Cookies. Hope you and your family have a wonderful Easter! Nothin makes me happier than balls and wine. This week I'm linking up my recipe for pesto meatballs. That's right. I put the pesto in the balls. Oh yeah. I went there. Hello Miz. Helen! I brought a new recipe I just discovered, Easy Breezy, Italian Cauliflower Cutlets. : ) I just loved reading your story on how Full Plate started, oh how I long for that kind of fellowship these days. I guess blogspot is one little way we can get that fellowship in a small way. A Blessing to be here! Hi Miz Helen! I shared my Cauliflower and Lentil Soup recipe today! Hope you have a lovely Easter! Thanks for hosting! I shared a profile of schizandra berry, a brain-boosting, stress-fighting fruit. Thank you so much for the feature, Miz Helen! Thank you for hosting another great party!! This week I am sharing fun facts AND why I love Dandelion!! Thanks so much for hosting Miz Helen. So many great selections; Finn and I always enjoy perusing all the recipes posted. I shared one of my favorites-- French Lentil Salad with Roasted Vegetables. Happy Friday, Mz. Helen!! Love all the new ideas you have on your very full plate! Thank you for hosting Miz Helen! I hope you and your family have a lovely Easter. Thanks for hosting another great party. As usual the dishes all look amazing. Hi Miz Helen, I've brought some sphaghetti to share! Thank you for hosting, have a lovely day!